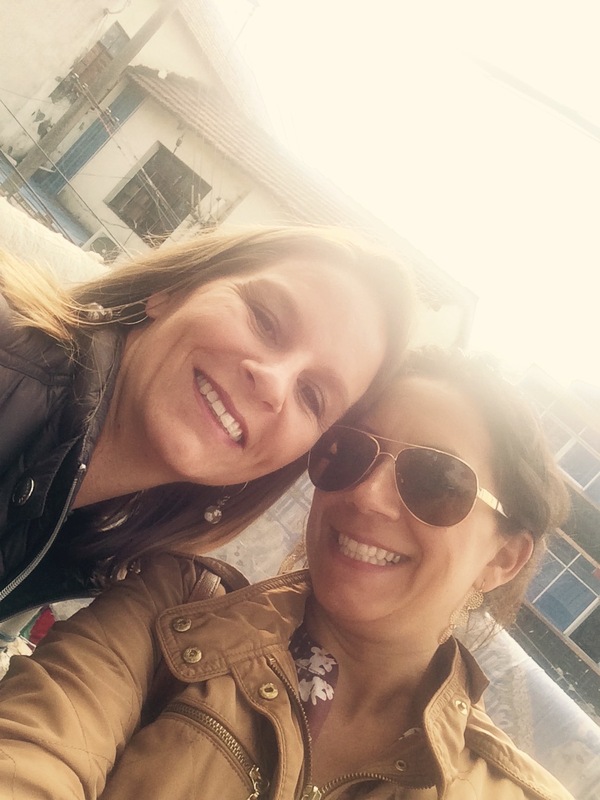 I spent the day yesterday touring a Migrant Town in Shanghai with my CF001. Skeptical at first about exploiting poor neighborhoods to satisfy my own curiosity I must say I was a) impressed by the tastefulness of the tour provided by Tracy Lesh b) inspired by the women we met who although live a life of poverty all seemed so happy and full of life c) wowed by the different foods I encountered at the market stalls in the neighborhood. I would like to first say that the SanQiao Tour was fantastic. The residents that we encountered are happy and eager to meet westerners and proud of their homes, life and work. What I liked best about the tour was these migrant women, originally from outside of Shanghai are not just downtrodden souls blacklisted from Chinese society. Instead they are hopeful women who have come to shanghai in search of a better life for themselves and their family. The word to be describe them would be resourceful. We first visited a seamstress from Jiangsu who came to the city to make money and support her family. She learned to be a seamstress from a friend and now works hard to support her 2 children mending clothes and fashioning new shirts and trousers for Laowei’s (expats). The second lady we met lives in a 4 room apartment with 10 other people. She works as an ayi (maid) for western families and was fortunate enough to have worked for a family who supported and encouraged get to learn English. Pleased with the quality of the tour I became enthralled by the food being sold throughout the neighborhood. Living in Hongqiao I am not as exposed to authentic Chinese life as you would think. In a guarded and gated community most of my exposure to Chinese life comes from the wet market across the street and conversations with my Shanghainese driver and migrant maid. Below are just some of the interesting, sometimes strange foods that we saw and tasted on our tour. To the left is Cat’s Eye. It’s a sweet treat made with wheat flour and red date paste. While it wasn’t overly flavorful it had a subtle sweetness and crunch that made it impossible to eat just one. Have you ever tried Hawthorn? In China, it is usually eaten after soaked in sugar, hardened and served on a bamboo skewer called tánghúlu. After a few internet searches I’m excited to buy some of this popular fruit to make Fruit Roll-Up. Just a heads up though, don’t eat the seeds as they contains cyanide. However, research shows that Hawthorn fruit is helps to improve heart circulation and function, so while you should avoid the seeds, go ahead and enjoy the fruit! The Lebanese love our dates! We eat them by the box and use them to make delicious pastries. Before China though I had never seen a raw date, just the dried up, pitted fruit. Fresh dates are delicious. They still have a date-like taste, but it drying out the date is when the flavors are really brought out. Here they are called Jujubes and are not juicy with just a hint of sweetness. Jujubes are in season from September through October so if you want to try them head over to the market now and grab a pound or two. When buying, look for half brown with smooth firm skin. Those are the freshest, but don’t throw them away once they are all brown. They’re still delicious just less crunchy. A flour based flat bread serves as a delicious snack as your strolling around the neighborhood. Made of flour and pressed to form a thin dough, cōngyóubǐng, is topped with green onions and sometimes chili. Nuts are plentiful here! One of the vendors purchased a roaster and is now roasting her own nuts and selling them to locals. It was truly a sight! Wish I was there to watch her roast but I’m assuming she does this early in the morning. The Chinese love their meats, especially pork and duck. Lots of different kinds of meats, but also different parts of the animals body. Chicken feet! The Chinese love it! While I think I’m adventurous, having eaten crocodile, zebra and duck heart, I draw the line when it comes to chicken feet. I don’t care how many Chinese and some adventurous Westerners say it’s quite tasty, I have no interest in ever proving them wrong. 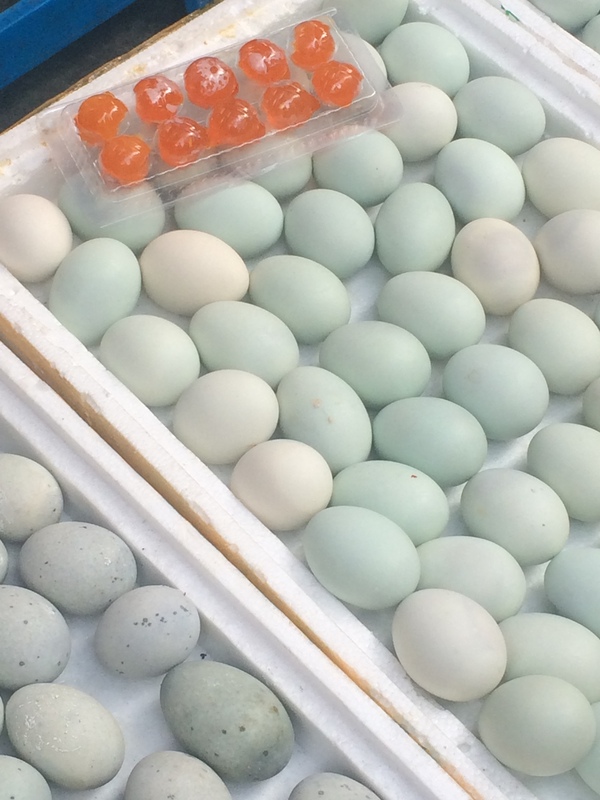 Every market is going to have fruits, vegetables, meat and of course eggs! Eggs come in many different forms here. How about egg soaked in 5-Spices including salt, old tea, sauce and star anise and cinnamon. The egg is already hard-boiled and the flavors of the sauce soak into the egg. It’s a popular treat on the first day of the Chinese New Year because it symbolizes receiving lots of money and good luck. Feeling even more adventurous? Duck egg is soaked in salt and water for several weeks and then eaten it in the morning with porridge. The egg white takes on a gelatin-like texture while the yolk turns bright orange. So the next time you’re strolling around the city, keep your eyes open and check out the food markets for unique eats.